Having recently opened just in time for St. Patrick’s Day a couple of weeks ago, O’Caine’s Irish Pub in Rancho Mirage is a new hotspot in the desert that serves up authentic Celtic cuisine and pays homage to the heart of Ireland. Complete with an in-restaurant gift shop, green illuminated bar with a variety of Irish beers on tap, and folk songs straight from the Emerald Isle playing in the background, it’s evident when you first step foot inside the place that O’Caine’s theme is on point. Already a full-house filled with hungry patrons even on a Monday night, O’Caine’s has quickly amassed a loyal following as being one of the only authentic Irish pubs in the Coachella Valley. My party was waited on by Nicolette, who contributed to the welcoming atmosphere with her endearing personality and genuine love for the establishment. She introduced the menu as being a simple selection of Irish staples with an American twist. As a starter, I ordered the Mini Fish Butties, consisting of Pacific Cod in house-made beer batter, minty pea coleslaw, tartar sauce, and lemon. This particular dish was an Irish take on the American slider, even served with French fries to boot. The fish was crisp and mingled well with the refreshingly flavorful coleslaw, taking me back to memories of seaside bistros in the summer. Overall, the sliders were a solid appetizer that may have been a bit too Americanized, but they certainly were a tasty preview of what was to come. The next dish of choice was the Celtic Caesar Sailead, made of romaine lettuce, Irish streaky bacon, garlic croutons, grana padano cheese, Caesar dressing, quinoa crispies, and house-cured smoked anchovies on a GoneStraw Farm egg Bottarga. The presentation of this salad was truly impressive, with a menagerie of textures and colors coming together to create a beautiful mural of garden variety deliciousness. The touch of anchovy put a unique spin on the commonplace Caesar, and the substantial portion size was enough to leave one feeling full and satisfied on its own. As for the main course, I selected an entree with a name I had never heard of called Authentic British Bangers. This curious-sounding dish consists of two sausages (bangers) nestled in a bed of malted mashed potatoes with Guinness onion gravy, and garnished with deep-fried onions. I was also informed that it was one of the most popular menu items. Although this plate is not the most photogenic entree and I was slightly intimidated by the mountain of potatoes placed before me, it was an extremely hearty and savory dish that best captured the essence of Irish culture and cuisine. The sausages were juicy and paired well with the tangy undertones of the gravy for an enjoyable dining experience. Gerard Noonan is a restaurant and hospitality development project manager who works as the pub consultant for O’Caine’s Irish Pub, and he strives to create a reputation for the eatery as the ideal neighborhood bar. 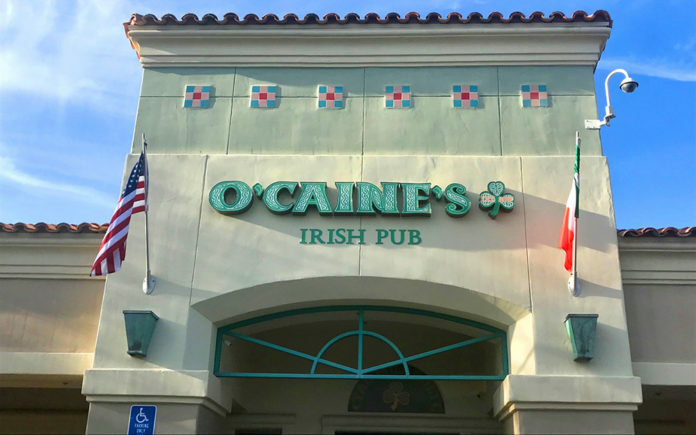 “[O’Caine’s] is the place where you’ll find the largest selection of Irish whiskies in the entire Coachella Valley, if not the entire world. It’s a great bar with a lot of very loyal patrons. We have an offer where you can select your own flight of three, four, five or six whiskies to taste them side by side. It’s a pretty unique deal,” explained Noonan. Although still a young establishment, O’Caine’s Irish Pub is quickly accumulating a faithful following and is an excellent way to immerse yourself in an atmosphere of delicious food, friendly people, and the luck of the Irish. O’Caines Irish Pub is located at 36101 Bob Hope Dr. in Rancho Mirage. Phone: 760-202-3311or www.ocainesirishpub.com.